As a completion of the re-design project for the Profi range of air operated hoists, the J D NEUHAUS company has launched its new Profi 75 TI and Profi 100 TI hoists, offering SWL capacities of 75 and 100 tonnes respectively. Existing products in the Profi range cover lift capacities from 250kg up to a full 60 tonnes, ideally suited to engineering environments. The company says the latest introductions, which incorporate savings in energy requirements as well as reductions in both weight and overall size dimensions, cover the demanding requirements of heavy engineering working conditions. 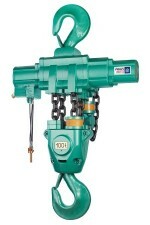 The key component of these hoists is a new air motor unit, based on the J D Neuhaus motor-brake concept and incorporating a patented integrated brake system, with a stepped brake piston and a reliable self-lubricating rotor. In the standard configuration of a 6 bar air pressure supply, the motor provides a 9kW power output, adequate for the operation of either hoist while still providing significant energy reductions. At full nominal lift capacities (75 or 100 tonnes), the compressed air consumed is 7.6m3/min which represents in excess of 30% saving over the hoists being replaced. On lowering of full loads, the air consumed is 6m3/min, which represents an impressive full 50% saving over the power/energy consumption of the hoists being replaced.